Beets are an important homegrown vegetable. They are a fairly easy crop to grow and are resistant to insects and diseases. They don't take up too much space in the garden and the entire plant is edible. Beets and beet greens are rich sources of iron and important vitamins. 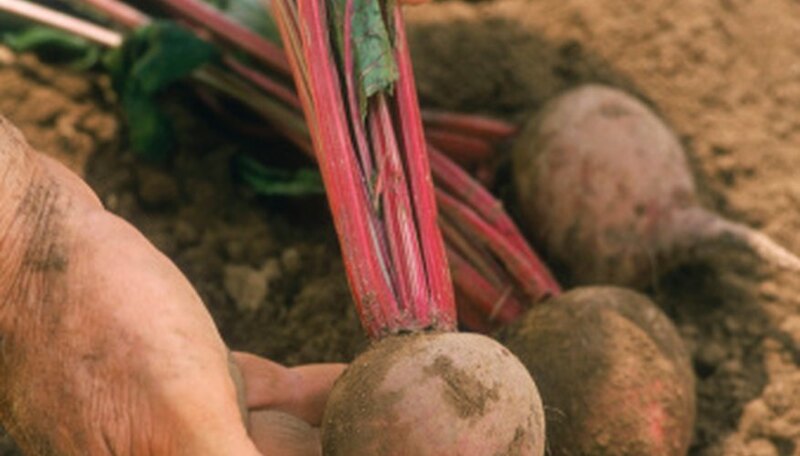 You can plant beets beginning in early spring and up until about 90 days before the first frost. It takes about 55 to 60 days for the roots to mature. Beets are easily planted from seed and they prefer a well-drained sandy soil. They do not thrive in acidic soil. Plant seeds 3/4 inch deep and about one inch apart. Rows should be about two feet apart. Beets can be planted in early spring as soon as soil can be worked, and the earlier crops make a tastier root. Successive plantings can be made about every three weeks until midsummer. Sow winter storage beets about 10 weeks before the first freeze is expected. Beets need thinning when the greens are about 4 to 5 inches tall. Thin the seedlings to allow for a beetroot to grow to a thickness of 2 inches. The ideal thinning method is to snip the greens and eat them in salads or cooked. You can also carefully dig up the seedlings and transplant them in a new location, but take care not to disturb the other roots. Keep beet plants well-weeded. They thrive best in cooler weather and bright sun. You can harvest nutritious beet greens throughout the growing season. Simply snip the outer leaves and add to salads, stir fries or steamed vegetable mixes. Roots are at their ideal size for harvest at about 1 1/2 inches in diameter. It takes about 60 days for a beet root to reach this size. Most varieties become tough and fibrous if they exceed 3 inches in diameter, so they should be harvested before this. Separate the greens from the roots before storing, but leave about an inch of stem on the beet root. The greens can be stored in the refrigerator for four to five days in a plastic bag, but are best eaten as soon as possible after harvest. Beet roots store well in a plastic bag in the refrigerator for several weeks. Overwintering varieties are sometimes stored in the ground until the ground freezes. Cut off the tops to retain moisture in the root. Sarah O'Leary has been writing professionally since 2006. Her work has appeared in "The Nation," "The Arcata Eye" and "ECONEWS," among other publications. O'Leary spent 20 years as owner/operator of Moonrise Herbs, a retail store specializing in medicinal herbs and personal growth products. She holds Bachelor of Arts degrees in journalism and women's studies from Humboldt State University.